What would life be without touch? A squeeze of a hand, the flash of heat from a burning flame, the jolting vibrations from a turbulent car ride – these are the physical experiences that remind us we’re alive. But, in an increasingly digital, increasingly virtual world, the power of touch is transforming how we interact with our devices, extending beyond the physical realm. David Parisi, associate professor of emerging media, says that humans experimenting with different forms of touch isn’t new, but that advances in haptics technology – and the new physical experiences they can yield – are. 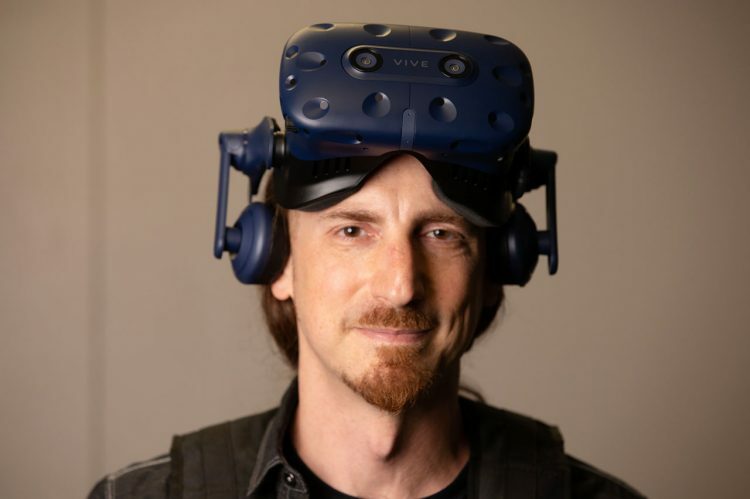 Parisi will explore the growing field of touch technology in a talk titled, “To Touch Impossible Things: Designing Haptic Sensations for Virtual Worlds,” in room 129 of the School of Sciences and Mathematics Building at 3:45 p.m. on Wednesday, April 10, 2019. The College Today posed a series of questions to Parisi ahead of his talk to find out about the evolution of haptics and whether a world not unlike The Matrix might be our future. Historically speaking, haptics refers to the scientific study of touch – akin to the way that optics was used to refer to the study of seeing, and acoustics to the study of hearing. Although it is derived from the Greek word haptikos, the term haptics was introduced in the late 19th century by experimental psychologists who were studying the way that the skin, joints and muscles take in the sensory data responsible for producing touch sensations. These researchers poked people with compass points, passed electrical current through their skin and injected them with ice water enemas, all in the hopes of discovering how the various nerves that made up the haptic system work to take in information from the world. More conventionally, haptics has come to refer to both the science and technology of touch, in recognition of the fact that there are now a whole range of digital devices that communicate through touch. Researchers first identified computer haptics as its own discipline in the early 1990s, but research into haptic interfaces for computers dates back to the late 1960s. What are some examples of haptics technology? Vibrating video game controllers are probably the paradigmatic example, because it’s such a widespread application of the technology: There are over a billion of these vibration-enabled controllers in circulation today (often called rumble feedback or just simply rumble). These vibrations, in conjunction with images and sounds, simulate the sensations happening to your avatar on the screen – so, if your avatar gets shot in the game, you feel the impact in your hands. And the more intense the impact, the more intense the vibration. It’s essentially teaching you a language of touch. That’s a very cheap and relatively easy instantiation of haptics tech. By contrast, more complex devices include the Teslasuit – a haptic bodysuit that uses a combination of vibration, electricity and temperature to simulate touch sensations in virtual reality. The HaptX VR glove is a combination glove and exoskeleton that fits over your hand, using 130 microfluidic actuators in the glove to simulate texture and the exoskeleton to simulate the shape and weight of virtual objects. Ultrahaptics is another relatively recent technology that uses ultrasonics to create touchless haptics – a sort of haptic hologram. But we’re not at the stage where you can just walk into a Best Buy and purchase one of these devices off the shelf. How do the worlds of haptics and communications, such as video games, movies, digital media, etc., intersect? Haptics tech has had a broad range of applications in its history, including surgical simulation, military training, computer-assisted design, assistive and sensory substitution devices for those with vision and hearing impairments, museum display, cybersex and in gaming and entertainment. But the most common use of haptics for communication is in smartphones and wearables like smartwatches and fitness trackers, where targeted bursts of vibration can be used to send a range of messages (“You have an incoming call from your mom” or “You hit 10,000 steps, good job!”) or substitute for physical buttons (such as the “haptic home” not-a-button button on the iPhone). These messages have both informational and emotional qualities; they communicate vital information that helps us process and respond to data more efficiently – like differentiating between a call from your mom and a call from a boss – while also prompting an affective response to the tactile cue (such as a little burst of feel-good adrenaline when we feel the vibration pattern associated with a call from a loved one). I would define my research focus as haptic media studies. Haptic media studies is basically the idea that touch has had and can have its own set of media and its own set of devices used to transmit data through touch. In a sense, haptic media studies is a response to fields like visual culture studies, which looks at the way images circulate through culture, and sound studies, which examines sound, audio cultures and the related technologies that allow for the storing and transmission of sounds. Proponents of haptic media studies suggest that scholars in communication and media studies should more generally think about our tactile relationships with our devices. A recent study found that the average user touches their smartphone 2,617 times in a single day; a haptic media studies perspective asserts that these repeated touches, swipes and presses have meaning that’s been neglected by audiovisual studies of media. In your book Archaeologies of Touch, you explore the history of haptic interfaces over the centuries. What are some examples of the earliest forms of haptic experimentation and how has that led us to where we are with haptic technology today? The book’s first chapter explores touch’s importance to 18th-century experiments with electricity. These experiments involved repeatedly touching and being shocked with electricity – whether it came from electric batteries or electric eels. Electric shock, during this early period, was a commodity that people would actually pay to experience. By the middle of the 19th century, electricity had been adopted as a treatment for a whole range of conditions, from tonsillitis to hearing impairments to headaches. While we conventionally associate electricity with 19th-century technologies like electric telegraphy and the lightbulb, these sorts of direct applications of electricity to the body predated the use of electricity for communication or illumination. Electricity was tactile before it was visual. So, we can think of these haptic experiences with electricity as essential precursors to today’s gloves and bodysuits. At the same time electrotherapists were applying current to the body, experimental psychologists in Europe and the U.S. began to develop a coherent scientific study of touch, applying a range of electrical and mechanical instruments to the skin. They used pointed compasses to test spatial acuity at various spots on the skin, tested the accuracy at which subjects perceived temperatures by pressing hot and cold liquid against the skin and jolted the body with electrical charges in order to test reaction time. We can establish a direct and fairly unbroken continuity of research from those early experiments quantifying touch to today’s haptic devices. What are the benefits of advanced haptic technologies? VR (virtual reality), and computers more generally, create this very unnatural situation, where you can see and hear and move objects in virtual space. But you can’t feel the objects that you interact with. More advanced haptic technologies offer to bring sensations of weight, temperature, shape and texture into VR – and even extend the sense of touch so that you can reach out and feel objects that are on distant continents. 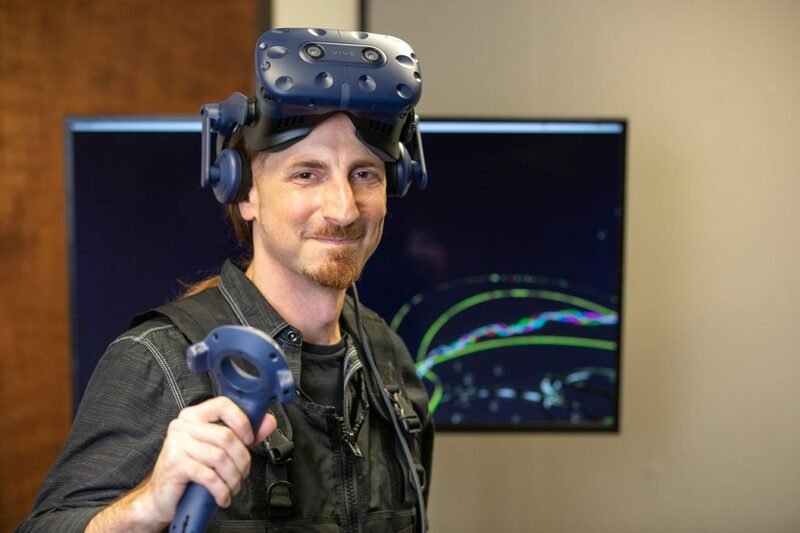 The potential benefits – and I say potential because most of this tech has not been widely deployed – of advanced haptics include everything from more effective training programs in VR to ameliorating the feeling of separation between physically distant people. What are the possible dangers of creating technology that offers vivid touch sensations in a virtual world? Any new form of communication is accompanied by new vulnerabilities, as well as new possibilities. Specific to touch, a more robust haptic interface like a glove or bodysuit requires its wearers to surrender control over their bodies to the device. It’s a very intimate relationship to the technology, and engineers have to be careful when designing the interface to make sure that it can’t injure the wearer in the event of a malfunction. Security vulnerabilities, present in any sort of online, networked interaction, become far more consequential when the results of a breach involve nonconsensual intimate touch. Pulling back to the more macro-level social ramifications of the technology, we have the challenges involved with replacing the real with its simulation: What sensations and relationships get lost in the process of translating atoms into bits? What forms of touch does the interface allow – and which ones does it filter out? Whose touch gets extended through digital networks? These are vital questions because they prompt us to think about the way haptics technologies can either perpetuate or challenge the traditional marginalization of bodies based on race, gender, sexuality and sensory ability. We won’t know the answer to these questions until we see how – and if – haptics technologies develop. To learn more about Parisi’s work check out his book Archaeologies of Touch.